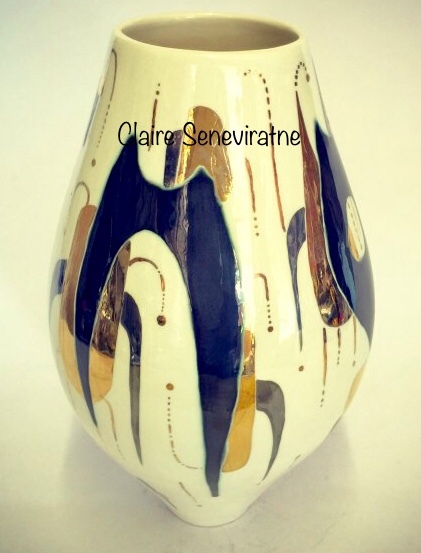 Claire Seneviratne - Ceramic Artist: Ceramic Pot with overlapping shapes and suspended circles. Ceramic Pot with overlapping shapes and suspended circles. Part of the' floating shapes' series which have strong influence from Henri Matisse, Joan Miro and Alexander Calder. this pot was slip cast and then after the initial firing was hand painted with clear and pewter glaze, refired and then hand painted with gold and platinum lustre. See video 2 in my blog/vlog section to get a better look!.